San Francisco magician Robert Strong has been entertaining corporate audiences with his comedy magic since 1985. 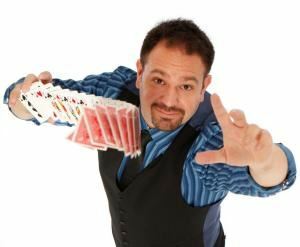 He is located in the Bay Area and travels all over the world entertaining audiences of all sizes with a colorful, visual, interactive, comedic variety show with magic, escapes, pick-pocketing, mind-reading, and juggling. Visit his website for photos and videos.